Q: How do I enable Wubi Zixing input in Windows? The Microsoft Wubi input method is in the "Simplified, China" and "Simplified, Singapore" language settings of Windows 8.1 and later. To find it, just follow my instructions for Windows 8 or Windows 10 Pinyin setup, and select Wubi instead. 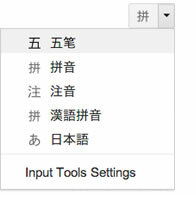 Google Input Tools includes a Wubi IME for use on any web page or web application in the Chrome browser, in Windows or any other OS, or of course in the Chrome OS. and also New Concept (新概念五笔) & training software (五笔快打) which keep moving so just search for those. Wubi input has also been included in many third-party suites, but last time I checked most had not been updated since Windows XP. For example, Chinese Plus and Chinese Star were distributed in the USA with English and Chinese instructions and support from a company called Suntendy. I believe Suntendy is out of business, but you may still be able to search for downloads of those software products. "Microsoft", "Windows", "Linux", "Ubuntu", "Wangma", "Sougou" and any other trademarks on this site are the sole property of their respective owners.